CONEX manufactures a vast range of split bolts connectors line taps to meet the material and dimensional specification laid by different International standards. 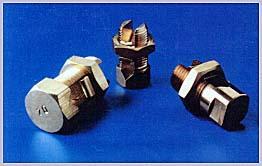 Brass line taps split bolts are made with high tensile Brass as per BS 2874 -CZ 112. Threads are formed by rolling process giving the nut extra clamping force. Pressure pads are made from extruded bars (NOT CAST), preventing the pads from cracking. Brass copper line taps Split bolts Split connectors are in natural brass and electro-tinned finish. Brass Split Bolt Connectors Line Taps Split Bolts Also supplied in high conductivity Copper.